Rebecca Manson Jones, Artistic Director of Just Jones & hosted a public discussion in June at Wells Way Pop Up with the Southwark “Chapter” of What Next. We’re due to hold another in November 2015. We’re really interested in meeting more people who want to continue the conversation about putting arts and culture at the centre of everyone’s life and thinking. What Next? is a movement bringing together arts and cultural organisations, individuals working in the arts/culture and the public who enjoy them. Spread all across the UK, we aim to articulate and strengthen the role of culture in our society. We want to involve everyone in new and different conversations about how and why the arts are important and become a catalyst for fresh thinking and new policy ideas. To encourage everyone in the UK, as individuals and as communities, to see connections between the many different ways art and culture affect and enhance our lives. To urge everyone to register their endorsement of – and pleasure in – their art and culture, especially where these are under threat. We have a diverse list of members who meet regularly in local ‘chapters’ to share enthusiasms, ideas and information. What Next? operates as a movement. We all speak for ourselves rather than with “one voice” but, as a national movement, we coalesce around the highest common denominator of ideas and needs that we can act on. 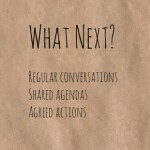 Find out more about What Next? Tagged Canada Water Culture Space, Just Jones &, justRMJ, open space technology, The Albany, What Next Culture, What Next Lewisham, What Next Southwark. Bookmark the permalink.